This is an experiment. At home with the sewing machine, Suzanne and I made this fabric thing, hemmed on the edges, with loops at the corners, and a funny fabric funnel stitched into a 4 inch hole cut in the fabric, which then ties onto a length of PVC tubing. This is a variation on a suggestion made by Lin and Larry Pardey in their book The Care and Feeding of Sailing Crew. I’m using cotton fabric rather than plastic, or waterproofed fabric, on the theory that if this works I will use it for drinking water, and I’d like to have fewer chemicals in the water. Never mind that I’m storing the water in plastic containers… Seriously, the same chemicals that make a plastic sheet flexible enough to not crack are keeping everything soft enough to also come away in the water. It’s a work in progress – first comes seeing if it’s possible to collect enough water with this small sheet of fabric to be practical. This first water will be for freshwater washing, and for watering plants. Then I get to work on hygienic strategies for drinking water, or resign myself to filtration. Here’s the good news! Today we had a good soaking rain for about an hour, and at the end of that I had refilled the 2 quart wash water jug, AND the 10 quart plastic bucket. That’s great news on the sheet size. I have a small plastic manual bilge pump dedicated to wash water transfer, so half the bucket got pumped into the freshwater tank (which topped it off) and the rest went for rinsing the salt out of those orange fuzzy rags that are so nice for dealing with stray water where it doesn’t belong. Still to go is drying the rain catcher cloth, which I didn’t leave set up because the wind was picking up and I was worried about it getting thrashed around. But once dry, it’s easy to store, and stays clean and salt-free. Not to mention free of stray dirt and bird droppings. I believe it’s going to be a workable system, and I’m ecstatic about being able to keep up with water for plants so easily. With that for inspiration, more planting has gone on in the interior containers that go in racks under the windows. More on that when they’ve grown enough to be a little more photogenic. 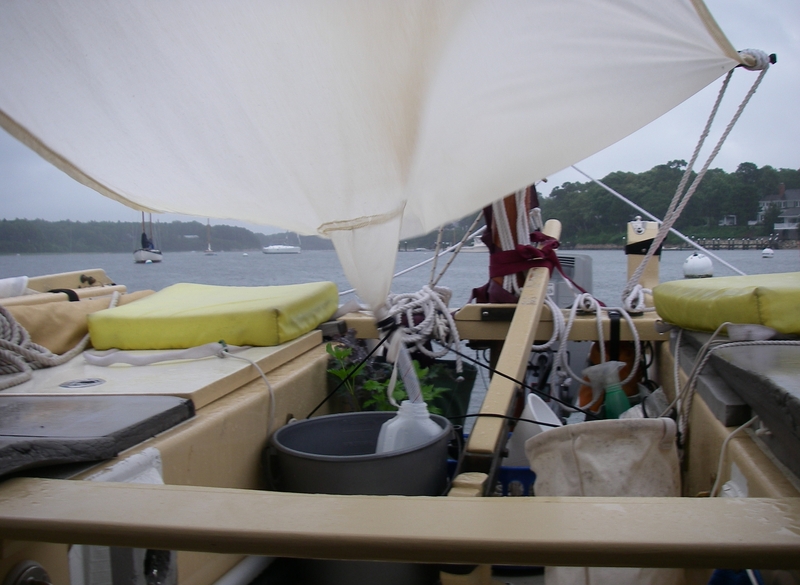 Meantime, here’s a try at including a picture of the rain catcher in action. Outdoor cockpit plants are slightly visible toward the back left, behind the bucket.